PLANTING: Start from container grown transplants spring through fall. Start seed indoors in late winter. Take cuttings anytime during the growing season. BLOOM/FRUIT: Purple spikes followed by small round seeds. GROWTH HABITS/CULTURE: Upright to sprawling character. Grows to 24 inches or taller with rough gray leaves. Beautiful purple flowers but it’s best that you do not let them bloom. Cut established plants back severely in the spring. This helps to prevent crown rot disease and die back. The cuttings can be rooted. Will grow easily from seed. PROBLEMS: Too much water will knock it out from crown rot. HARVEST/STORAGE: Anytime but try to avoid heavy harvesting the first year. Store dry in a tightly sealed glass jar. CULINARY USES: Cook with beans, potatoes, breads, vegetables, meats, dressings, gravies, eggs, potatoes, beans, beer, wine. Is used in vinegars. MEDICINAL USES: Said to be good for memory, tonsilitis, and the digestive system. Some people eat a leaf raw each day. It’s excellent in teas and can be crushed and ground and added to toothpaste to serve as a antiseptic and to help remove plaque. It has been reported that a sage leaf bath can help stimulate blood circulation. LANDSCAPE USES: Makes a decent container plant. OTHER USES: Use as a bed in a bowl or basket for kitchen storage of tomatoes and other vegetables. 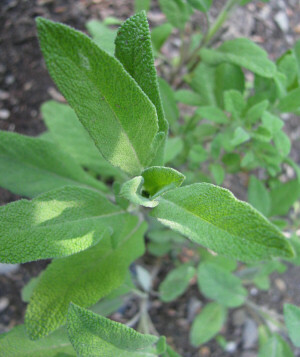 Make a sage pillow from dry leaves for a relaxing sleep. INSIGHT: One of the longevity herbs. Don’t let bloom for best leaves. Dry leaves can become carcinogenic from the high amounts of volatile oils. It’s best to use fresh or within 6 months after drying. All salvia leaves and flowers lose their flavor when heated.